After a period of consolidation, the Dow Jones Utility Index (DJU) appears to be making its move to higher levels. Earlier in the year, the threat of rising interest rates and a steeper yield helped keep utility stocks mired in a narrow range. Fears of inflation, other than just at the commodity level, were also a concern for would-be utility investors. Modest employment gains supported the theory that the economy would likely become more robust in the months ahead. The Federal Reserve’s quantitative earning measures intensified these worries by leading to a weaker dollar, higher commodity prices and a batch of better-than-expected earnings announcements. Nevertheless, a sluggish housing market, trepidation over debt restructuring in Europe, the expectation for layoffs at the state and municipal government level in the U.S., and a reversal in commodity prices now have yield seekers looking for safe and reliable returns once again. The chart of Dow Jones Utility Index currently depicts a bullish reverse Head & Shoulders pattern that targets a move up to the 525 level, representing a 20% gain from current levels. 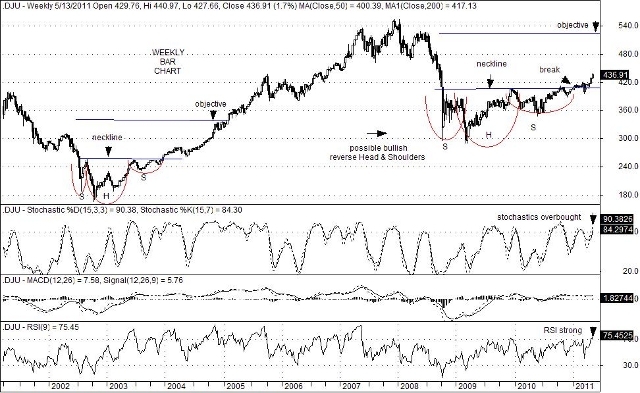 This formation mirrors a similar set-up that developed between 2002 and 2003 that led to move that far exceeded the objective of its bullish reverse Head & Shoulders back then. In any event, there are a number of utility stocks whose yields are still in the 4-1/2% -to-5% range. They include: American Electric Power Co., (AEP at 4.60%); Consolidated Edison (ED at 4.41%); Duke Energy (DUK at 5.07%); Exelon (EXC at 5.03%); FirstEnergy (FE at 5.17%); NiSource (NI at 4.52%); and Southern Company (SO at 4.49%). In a week that witnessed a bubble bursting in the Silver markets and an upward reversal in the heavily shorted U.S. Dollar Index (DXY), the CBOE S&P 500 Volatility Index (VIX) jumped smartly accompanied by deeply oversold conditions. In the absence of an interest rate hike in Europe, and in the wake of the demise of Osama Bin Laden, the ever present “risk” trade began to unwind. Back-to-back margin requirement increases announced for Silver futures appeared to shake out many speculators initially. Selling activity intensified, however, following the revelation that both George Soros and Carlos Slim had either sold, or hedged large silver holdings by mid-week. Amid reversals in both the dollar and precious metals, the S&P 500 Index suffered selling pressures as well. This was clearly reflected in last week’s jump in the VIX. 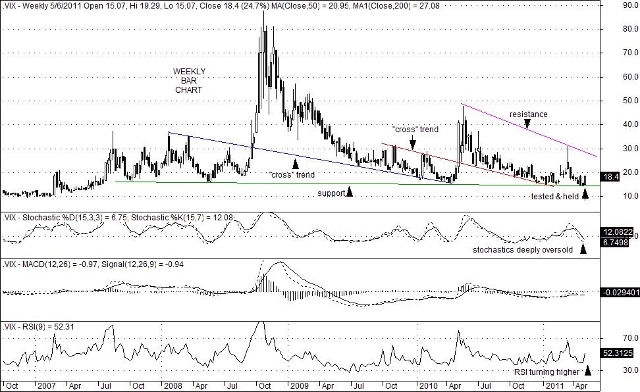 Importantly, its weekly chart reveals that deeply oversold conditions continue to be present even after last week’s sharp upward move. In turn, this condition suggests that the recent upward thrust in volatility has likely more room to run. Key trend line resistance, although downward sloping, nevertheless sits at the lofty level of 27.50. That hints that the recent downward move in equity prices may also have more to decline. This is not to say that the “Go Away in May” slogan has kicked in with thud. But with the end of QE2 expected in June, “risk” taking of all sorts may get pared back in the weeks just ahead. You are currently browsing the Charted Territories blog archives for May, 2011.